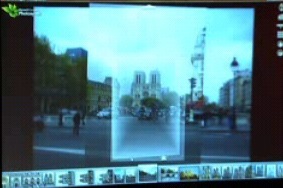 I just saw this on a TED talk, it’s called PhotoSynth. Basically, it brings together photos from all sorts of different angles to construct a 3D model of something. As an example, the guy gets pictures of Notre Dame de Paris from flicker and PhotoSynth then works out how to stick them all together. He then sort of flies around looking at different parts of the cathedral. I really didn’t think current image processing technology could do this… it’s like sci-fi come real.